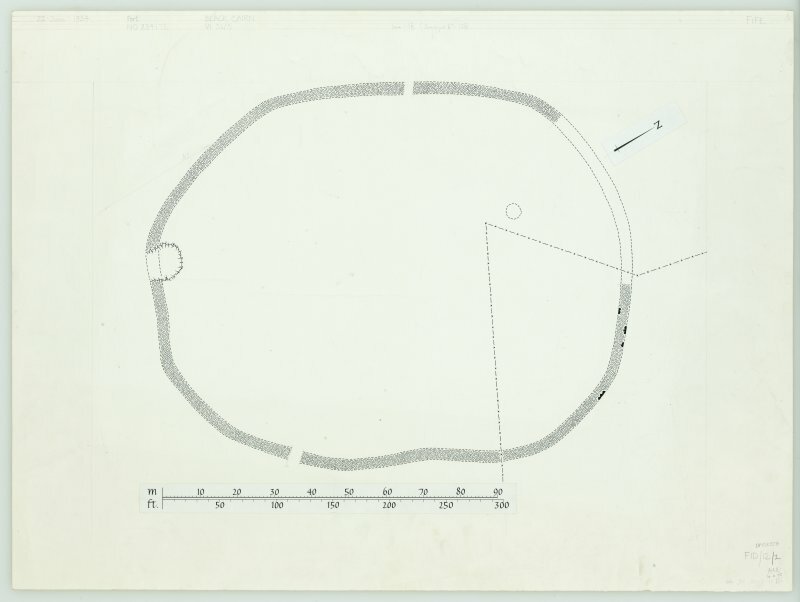 Plane -table survey: fort at Black Cairn. Ink drawing: fort at Black Cairn. (NO 234 172). This fort, formerly known as 'The Ring', is situated on the summit of Black Cairn Hill. 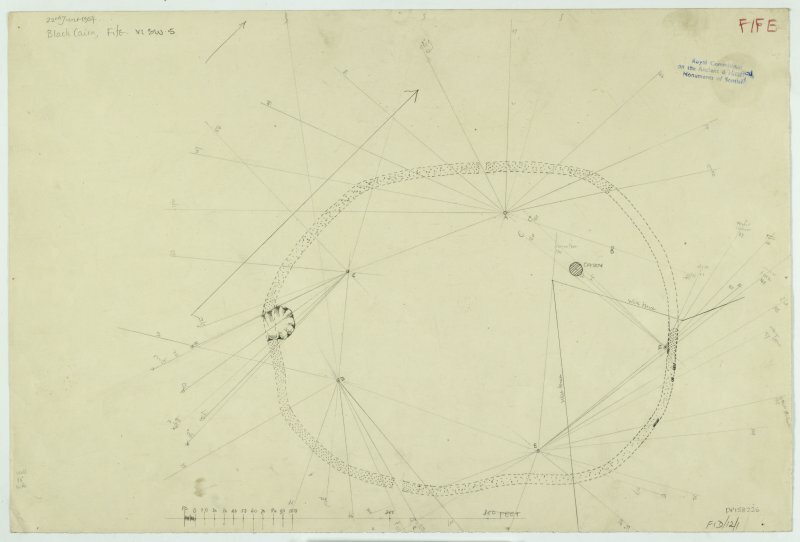 It is oval in outline, bounded by a single stone wall, and measures internally 405' (123.5m) by 320' (97.5m). For a distance of 160' (48.8m) on the N side, where it skirted the base of a rock outcrop, the wall has completely vanished, and elsewhere it is reduced to a mere rickle of stones, a few facing stones which are still in position at the NE end indicate, however, that it was c.10' (3m) wide. Two gaps in the wall, on the NW and SE sides may represent original entrances, but the interior shows no signs of structures. RCAHMS 1933; Information in RCAHMS typescript, 22 June 1954. A fort generally as described by RCAHM, except that the NW gap may be modern. Visited by OS (R D) 20 May 1970. Black Cairn Hill forms the highest part of Newburgh Common and is surmounted by a large oval fort measuring about 123m from NNE to SSW by 95m transversely (0.9ha) within a rampart reduced to little more than a band of stones. A sector on the N has been entirely removed, but a few facing-stones remain in place on the NE, indicating an original thickness of some 3m. There are entrances on the SE and WNW, though in the opinion of the OS surveyor in 1970 the latter may be relatively recent. A small quarry has also been dug across the line of the rampart on the SSW. Apart from a modern cairn marking the boundary between the parishes of Abdie and Newburgh, the interior is featureless.